Hey all you Cardinal Fans, Tuesday, October 25th, is the last chance to catch a look at the future stars of Cardinal Football. The 7th, 8th, and 9th grade teams play Oologah at Sallee Field. Games begin at 5:00pm. Hope to see you there to watch an exciting Bedlam series between these two rivalries. Members of the NE Oklahoma Chapter of Newborns In Need met October 11, 2011 with Cherokee Nation officials at the Pecan Porch in Catoosa, OK to discuss current needs of the Cherokee Nation Indian Child Welfare organization. The group meets once or twice annually to determine how best NIN can serve the Cherokee Nation in the NE OK area, in addition to several other hospitals, shelters, crisis centers, etc. L-R: Greater OK NIN President Joann Drye, CNICW Program Mgr Hettie Charboneau, CNICW Program Mgr Sandra Edgmon, NIN member Sue Ellison, CNICW Program Mgr Lou Stretch, and NIN Sec'y/Editor Linda Pfeffer. Collinsville High School will host the 2011 ASA Entertainment High School Tour. 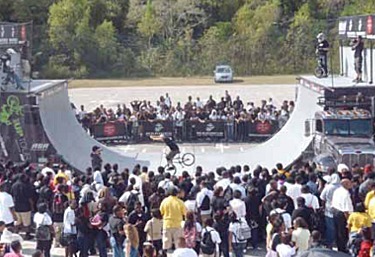 The anti-tobacco high school tour is in it's 12th year educating the youth of today about the dangers of tobacco use. See top athletes shred the half-pipe. Tour sponsors are The Campaign for Tobacco Free Kids and the US Marine Corps. Mary Wood looks on as new member Velma Touriainer displays her latest quilt project at the October 11, 2011 meeting of the Collinsville Patchworkers. Janice Coke presented a program on loom knitting, plus gave a demonstration on a new way to cut bias strips for quilt binding. The next meeting will be November 8 at the Library, and is open to the public.